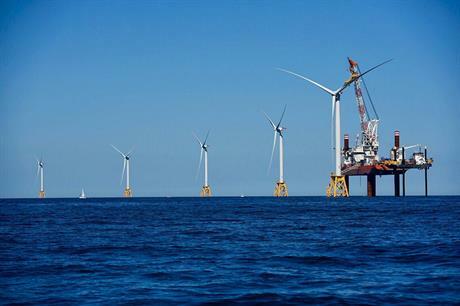 UNITED STATES: Three developers have submitted bids in the US state of Massachusetts for up to 800MW of offshore wind capacity. The partnership between Denmark's Ørsted (formerly Dong Energy) and Eversource has put forward a bid that includes part of the 1GW Bay State wind project, plus 55MW of battery storage. Deepwater Wind, which developed the country's first offshore project, the 30MW Block Island development, also submitted a bid for a project providing peak power. Revolution Wind would be paired with an offshore transmission backbone, in partnership with National Grid and the Northfield Mountain hydro pumped storage facility, operated by FirstLight Power. Revolution would be one phase of the 1GW Deepwater ONE project. And Vineyard Wind, a joint venture between Avangrid Renewables and Copenhagen Infrastructure Partners, submitted an 800MW project. Massachusetts is the hub of the US's nascent offshore wind industry. The state has a law that requires electric distribution companies to buy 1.6GW of offshore wind by 2027. The final solicitation will be in 2019.